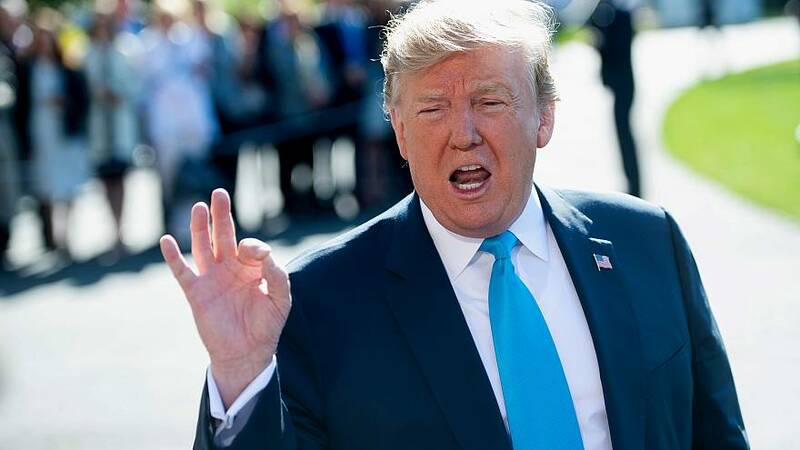 President Donald Trump on Wednesday blasted the investigation into Russian election interference and obstruction of justice as "an attempted coup" against his presidency. In comments to reporters on the White House South Lawn — some of his harshest to date since special counsel Robert Mueller's probe ended — Trump said the probe was "started illegally" and that "every single thing about it" was "crooked." "There were dirty cops, these were bad people," he said, listing off former FBI Director James Comey, former FBI Deputy Director Andrew McCabe, former FBI agent Peter Strzok and ex-FBI lawyer Lisa Page. "And this was an attempted coup. This was an attempted take down of a president. And we beat them, we beat them," Trump said. "So the Mueller report, when they talk about obstruction, we fight back. And you know why we fight back? Because I knew how illegal this whole thing was, it was a scam." Trump added that what he was "most interested in" now was a review by Attorney General William Barr of the conduct of the FBI's Russia probe during the summer of 2016. "What I'm most interested in is … getting started on going back to the origins of exactly where this all started, because this was an illegal witch hunt and everybody knew it and they knew it too and they got caught," he said. "What they did was treason, what they did was terrible, what they did was against our Constitution," Trump said.